You can use Form fields for any document information you want your users/third parties to fill, but also for intake forms, vendor requests, or sales requests. Assign who can fill out the field: someone from your company, an external party, etc. Fields to be filled out will be highlighted in yellow. Once updated, they will turn green. Then click on the "Form fields" button in the top left of the document page. Note: please ensure that third parties are given limited editing rights only when sharing the document. This will allow third parties to fill the fields, but not edit the document. Previously on Concord, we only offered "required fields", which are a version of Form fields with less functionality. 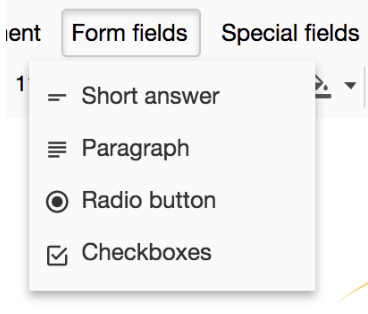 Required fields work the same way as Short answers (one of the Form fields) but you cannot set them as optional. Can I still work with documents that contain the original Required fields? How do I convert the old Required fields in my document to Form fields?